Oppdag den ville siden av Sør-Florida på en spennende Everglades airboat tur etterfulgt av et alligator show! Etter å ha blitt hentet fra Miami eller Fort Lauderdale, vil du tilbringe fire timer med lokale naturalister som lærer om Everglades National Park. Gli dypt inn i søvnige sumpene for å oppdage dyr som slanger, gators og eksotiske fugler, og hodet tilbake til land for et nærliggende alligatorshow. Se noen av verdens største reptiler som utfører triks og stunts! Lia was great! She took good care of us. The airboat at Holiday Park was fun and the alligator show was very good. Highly recommend. Viator has never let us down. Very good excursions. Our guide, Lia, was very helpful, knowledgeable and pleasant. She was there for us at the port, took care of us during our air boat ride and worked with us on what we wanted to do. Very pleasant experience. Would highly recommend it to anyone. The driver was wonderful, timely, informative and didn't rush us at all. If anything he tried to stretch out the day so we wouldn't have to wait in the airport too long. The tour however lacked substance. Not too much wildlife, which isn't anyone's fault and the show afterwards, while entertaining, had way too many sexual references for an audience filled with children. Wouldn't recommend this tour, especially for families. I recommend the tour NOW that they have updated the description and the picture of the boat you go on. 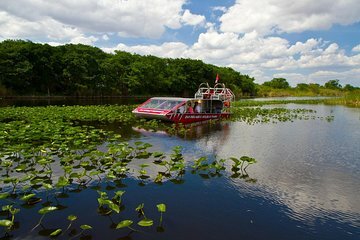 When I booked this back in March for an April 16th tour after our cruise, the description said private tour and had a picture of an airboat with a family of four in it. Not the covered Airboat now shown. So I was disappointed when we got to the boat and saw that this was what it was. Either I was the first to complain or others were and they have changed the picture. It was nice to be personally picked up at the cruise port and then brought to the airport after the tour. The airboat ride was a good experience and fun time. Again, if I had known it was not a Private airboat and the open one, I would have given it 4 or 5 stars, but was very disappointed in the false advertising which has since been corrected. While our guide was 5 star, The activities were not. The airboat ride in the picture shows 4 people on a boat, and what we got was a huge boat with 25 people, couldn't see from the middle seats and a circle route with dozens of boats. It was a cattle call and disappointing. Not what we paid for.